I have been having so much fun updating my son’s room over the last few weeks. 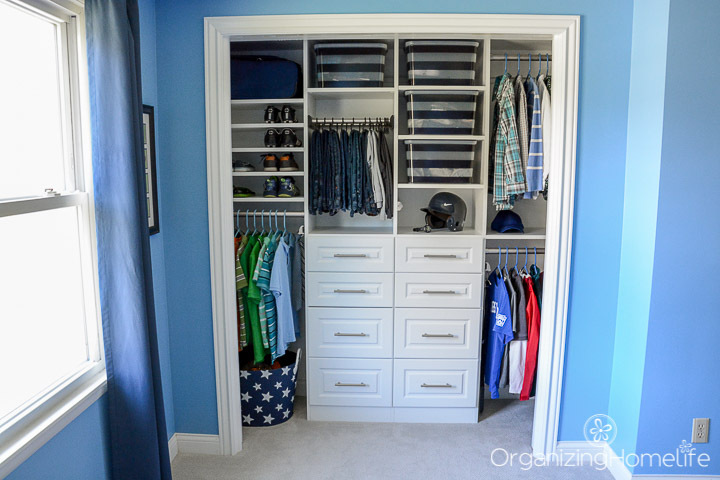 We’ve had carpet installed, updated some of his decor, installed new shelves, emptied his closet (see the before pics here) and made a plan for organizing his closet, and today I’m going to show you the organized closet reveal! It is one of the most amazing and appreciated updates we’ve done. And if you haven’t heard, you have a chance to win a custom closet system, made by my favorite closet organizing company – EasyClosets! Watch for the details soon! Are you ready for the reveal? I’m so excited to share it with you! Eeek! I am so happy with how it all came together. 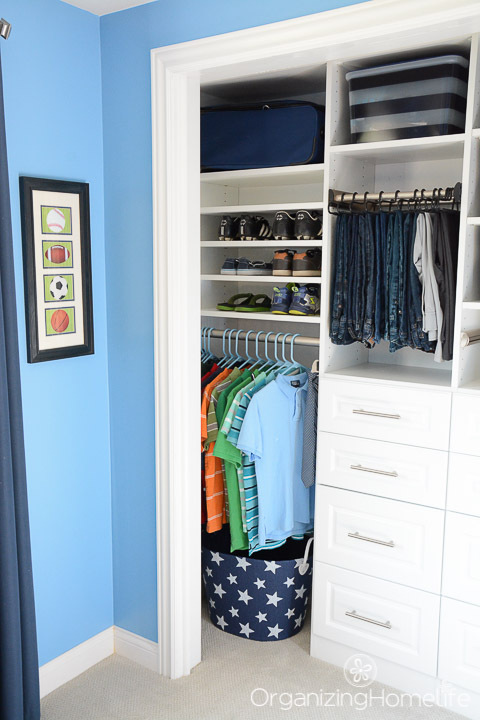 His previous closet, although a spacious size for one boy, wasn’t being maximized space wise. 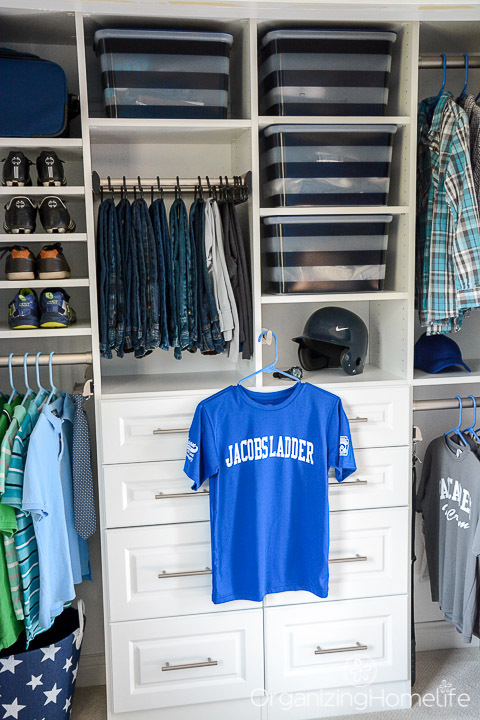 I wanted to get rid of his small dresser and keep all of his clothes in his closet. 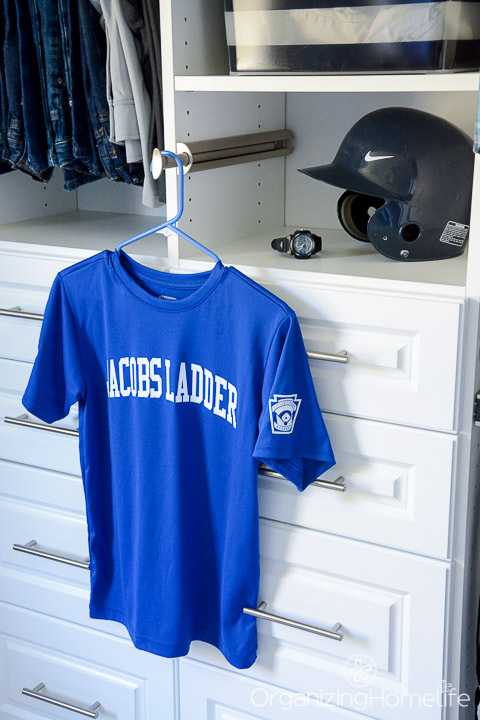 Plus, I wanted to better organize some of the things he’s using at this stage – like his sports uniforms and some of his equipment. One thing I cannot recommend highly enough when organizing a kid’s closet is to keep containers with out of season clothes available, but separated from everyday wear. I keep several bins in my son’s closet, some with clothes that are slightly too big, and some that fit but are out of season. That way if we have a quick weather change, he’ll have some outfits to wear. I love having drawers in his closet! 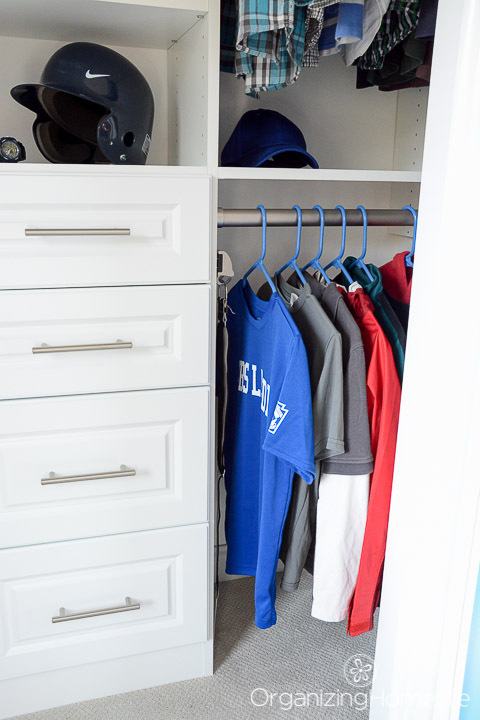 They are bigger and deeper and offer more space than his old dresser, but still allow for more hanging space than he previously had since he has four hanging racks now (the end sections are wider than the center sections)! I chose soft-close drawer glides because they are absolutely awesome for kids. No more slammed drawers and pinched fingers. They’re so simple (and quiet) to close. 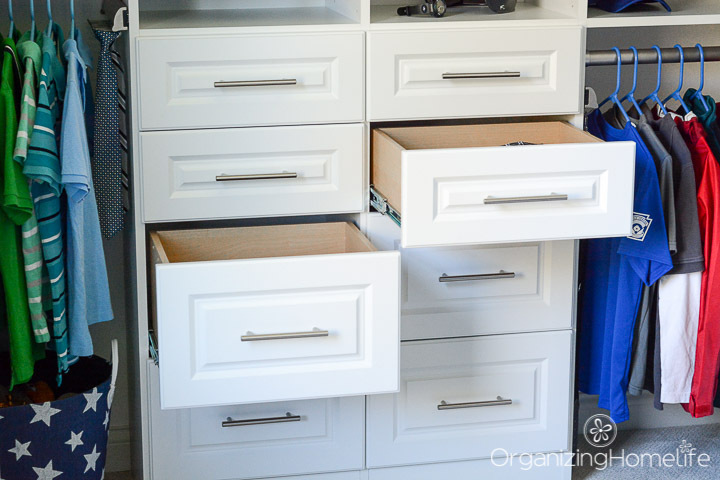 I chose two sets of 12″ drawers for the lower section and two sets of 5″ drawers for the top. 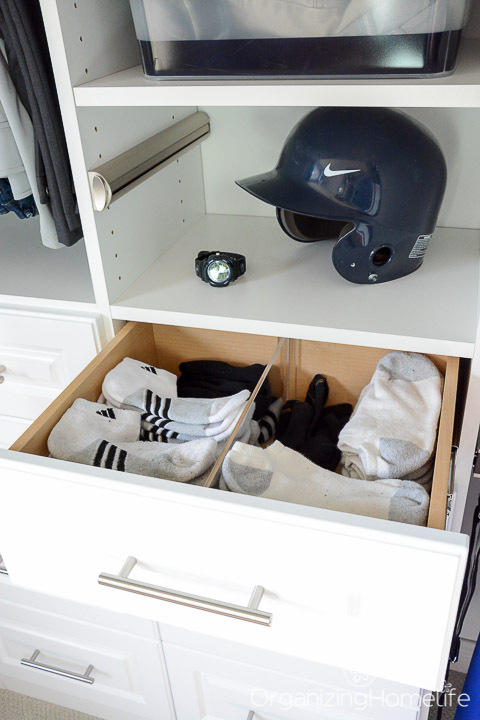 I also opted for drawer dividers so his socks could easily be separated. I use to ball his socks by folding over the tops, but he totally impressed me when I opened his drawer and found that he organized his socks like this! 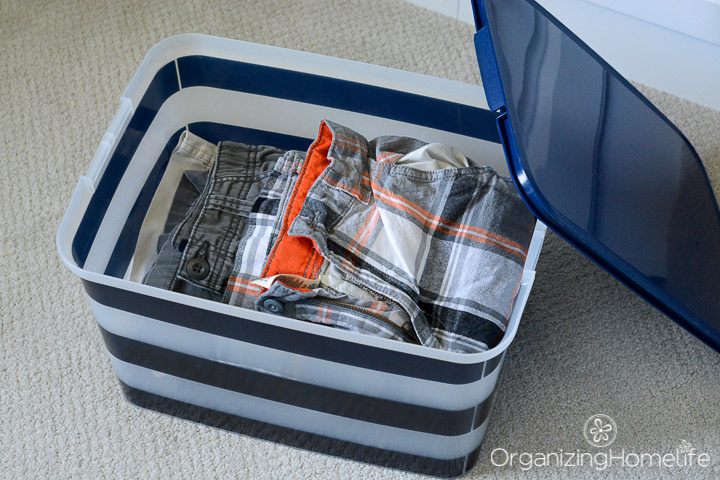 In the 5″ drawers, we’re keeping his swim suits, socks, underwear, and pj shorts. 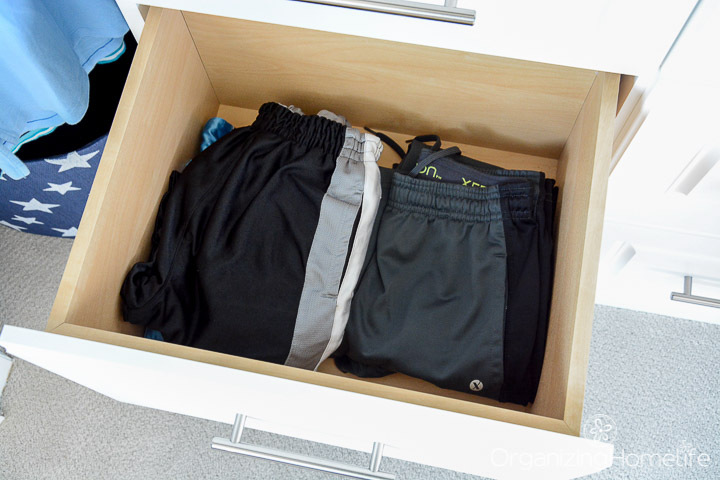 In the deeper 12″ drawers, we’re keeping his athletic pants, t-shirts, and other everyday wear. 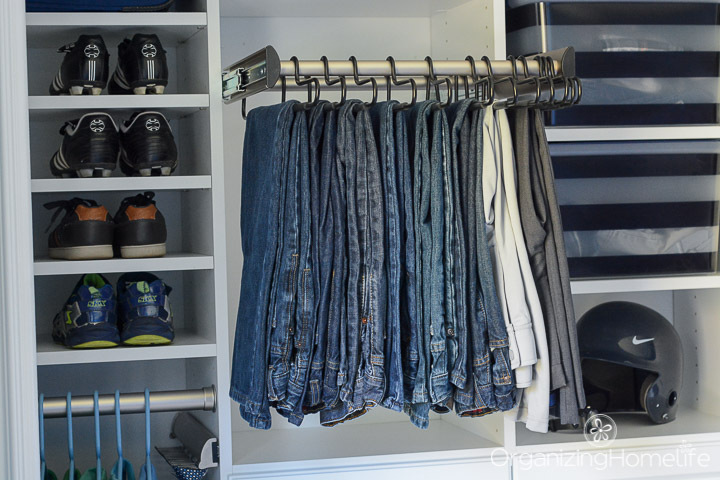 I also opted for a slide out pants rack so he can easily hang his jeans and dress pants. One of my favorite features is the valet pole. It slides out so an outfit can be hung front and center to make “setting out an outfit for the next day” as simple as possible. Since my son is at the in-between stage of being a “tween”, he still has some things he isn’t quite ready to part with, but doesn’t play with often. I found a basket at Home Goods to organize his favorite stuffed animals. It tucks nicely right below his shirts. 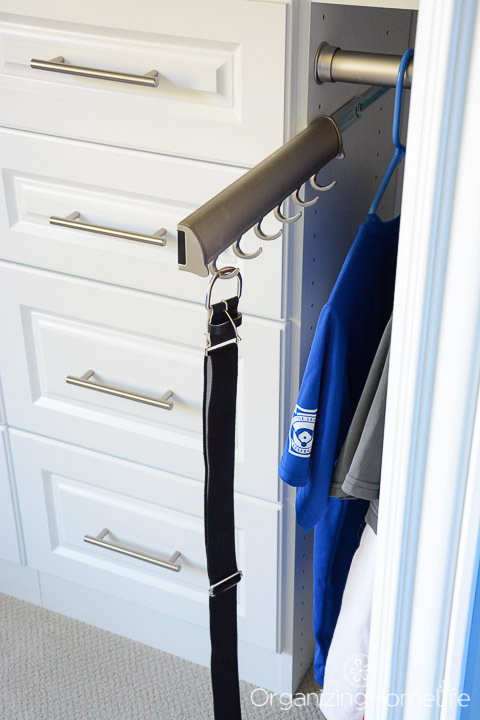 Another feature that will be more useful for him as he grows older is the slide-out belt rack. As you can see, he doesn’t wear many belts now, but that’s why I love that this closet will grow with him. When not in use, it tucks discreetly out of the way. I love that there are different “sections” so I can organize his long-sleeved shirts separately from his short-sleeved shirts when the weather calls for both. 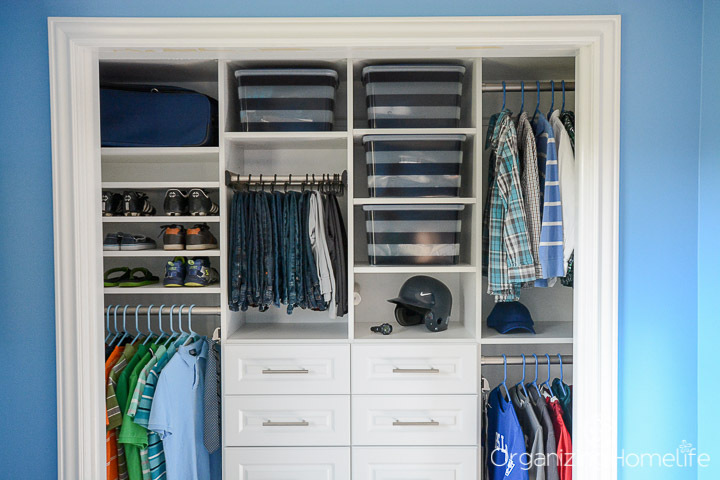 He also has organized spaces to keep his sports uniforms. Before and afters are always so fun, so we can’t end this without a few! 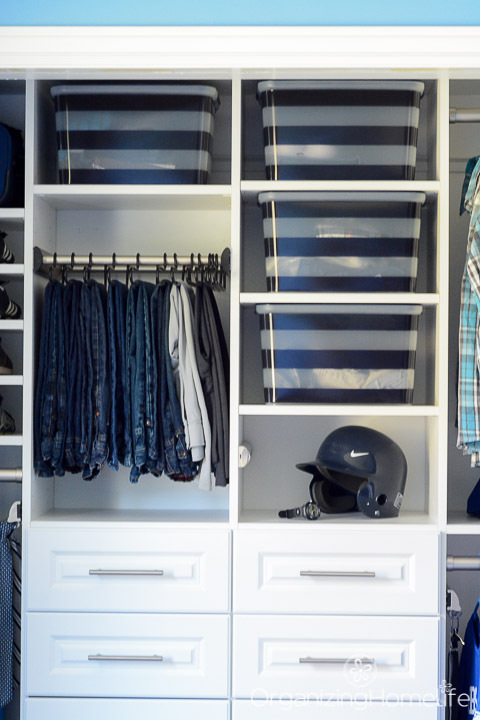 If you’re considering a closet organizational system, I would highly recommend EasyClosets. They are affordable and definitely worth the investment. 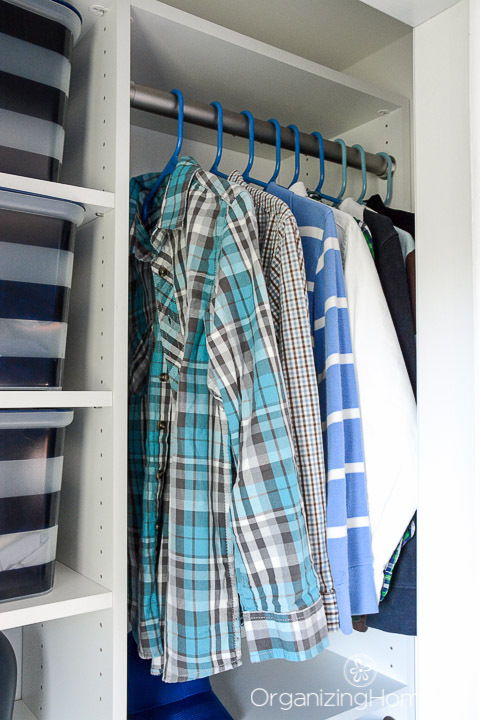 Create an inexpensive basic closet solution or upgrade to “extras” like soft-close drawers and various accessories. Quality, quality, quality. Even the boxes the parts come in are superbly marked and packed with care. 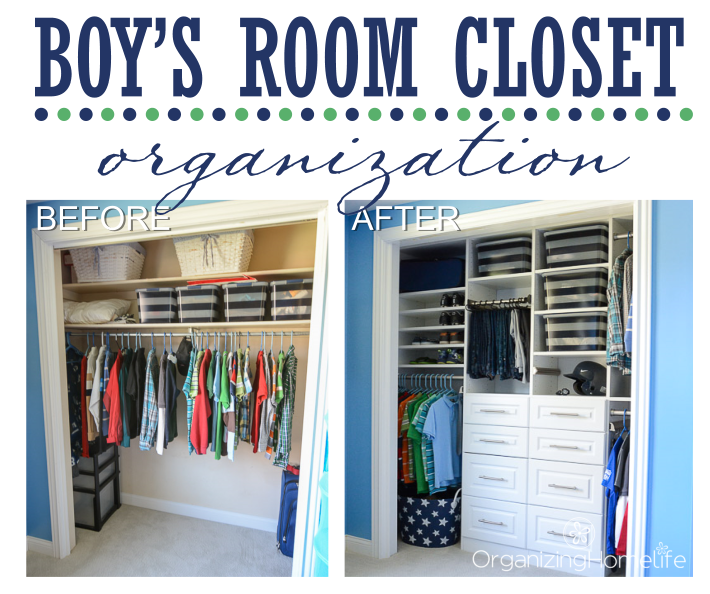 I’m giving away a $1,000 organizational closet system made by EasyClosets! And YOU will have a chance to win! Watch for details soon! 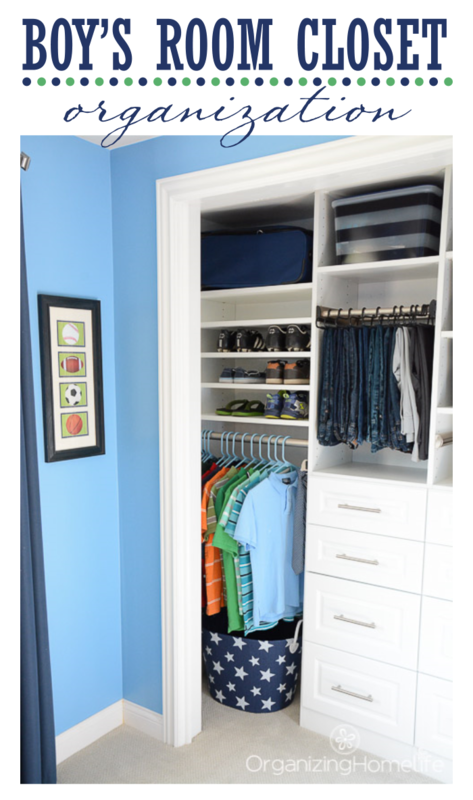 Disclosure: Thanks so much to EasyClosets for providing this closet system. All opinions in this post are completely my own and I was not influenced to write a positive review in any way. I chose to work with EasyClosets again because I believe they are a superb company and I take pride in recommending companies and products that have proven excellence. See my full disclosure policy here. 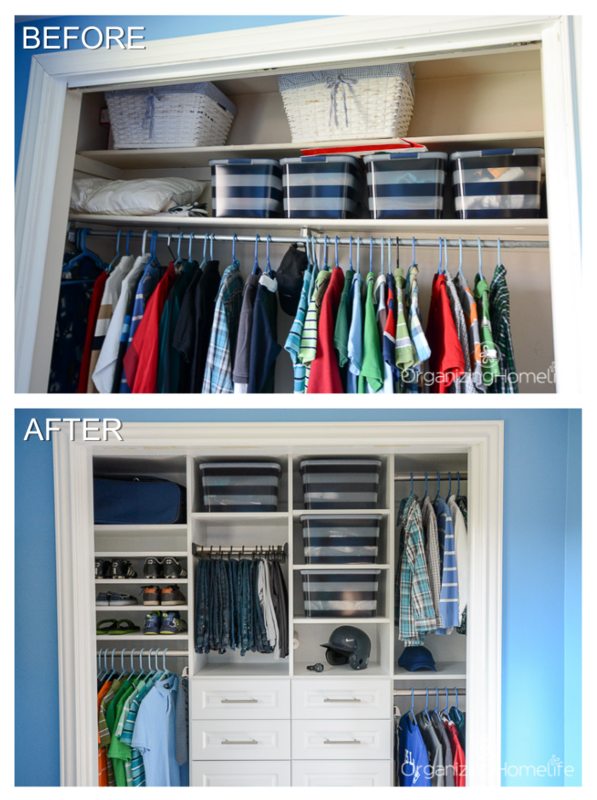 Absolutely amazing redo of a closet into such an organized and visually appealing space. I love it and wish my kids closets were that big. They both have teeny tiny closets that are not very functional. Thank you for always inspiring me. We lived in a 900 sq. ft. home and had 3 kids in the same room with a closet less than half the size of this closet, so I totally understand! I suggest only keeping what they really need and use regularly in the closet. Try to find other places to store other things. I also highly recommend only keeping in-season clothing with just a few out-of-season outfits in case of a weather change. 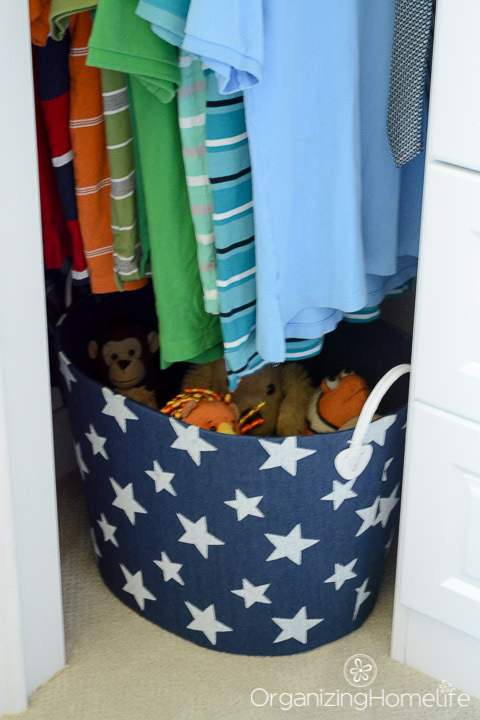 Store other clothing in a container in an attic or basement, or even an under-bed storage container, if possible. I really love the closet makeover. I’ve been wanting to do something with my son’s closet and this just motivated me. 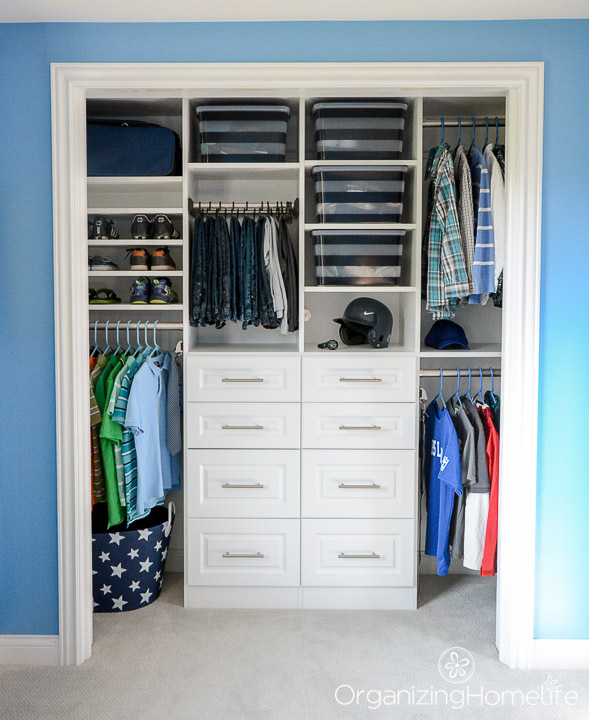 Do you mind sharing the dimensions of your son’s closet? Thanks for providing some visual options and the Easy Closets recommendation. Thanks, Syctrilas! I’m glad to have given you some help and motivation. This closet is 85″ wide and we went with the standard height closet (84″) since our ceilings are about 7 1/2 ft. high. That leaves us with an extra 6″ on top of the closet system where we can store blankets, etc. Where did you buy the hangers? I have problems buying ones to fit my tweens’ clothes. Childrens’ hangers are too small and adult ones too big.. 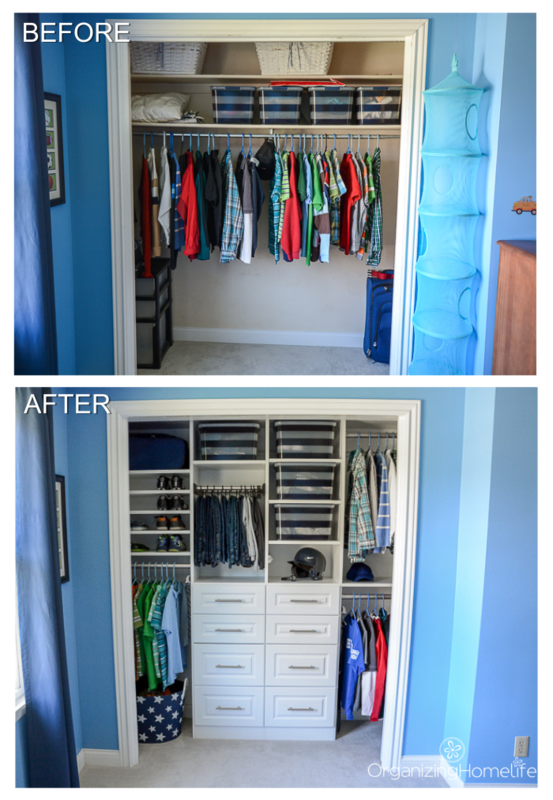 This closet makeover is great. 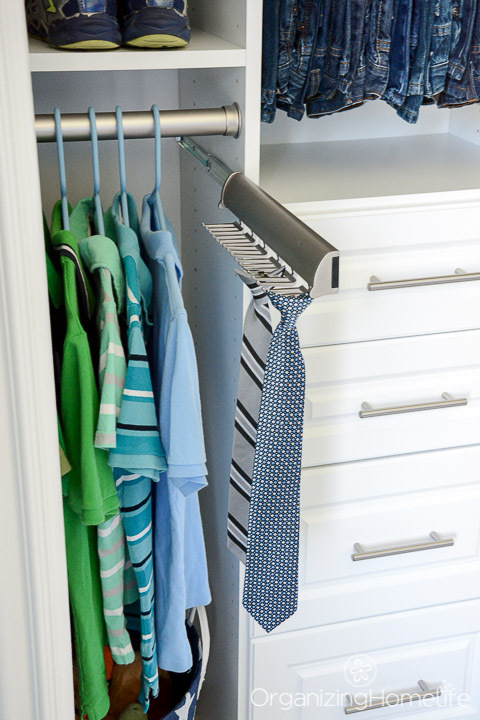 I love the drawers and the tie and belt racks. It’s a great use of space. It looks beautiful Ginny! I love how much more “space” you have even though it’s the same closet. It’s been exciting following you on this journey. I absolutely love how it turned out. You did such an awesome job! 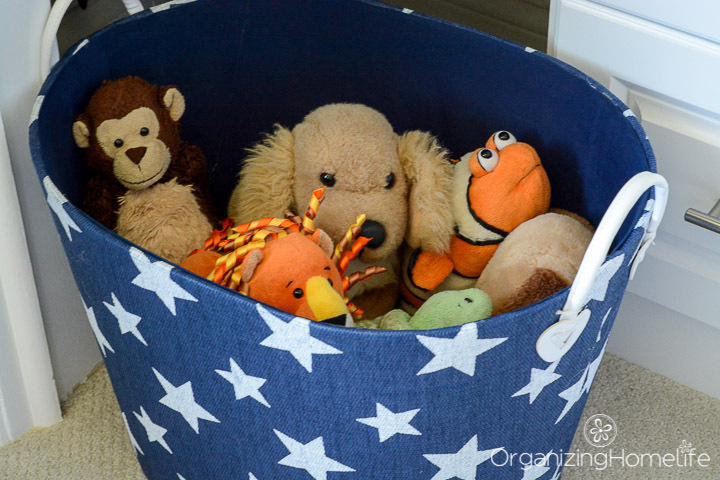 I like that basket for his stuffed animals. My son could use something like that, because right now they practically take over the whole bed! Those clear tubs that are on the shelves – did they come with the stripes or did you add them somehow? This is what I want to do to all of the closets in our 1956 rancher! What a great way to stretch every bit of space! I LOVE the drawers. In our house they would allow us to ditch a dresser or two to free up much-needed floor space. Thanks so much for welcoming us into your home, Ginny. I noticed with the socks that you didn’t roll them up into a ball. Can you explain why? I know that some people say that the normal way of rolling them up, roll from the toe to top and flip the elastic over stretches out the elastic, so I just line them up and fold one end over leaving half of the socks hanging out the ball at the top. I hope that was an ok description. What do you think? Where did you buy the blue striped containers? Those are awesome!